Minnesota is no stranger to sustainable stadiums. TCF BankStadium was the first college football field to achieve LEED certification (Silver) for New Construction, the Xcel Energy Center is LEED-certified for Existing Buildings, and CHS Field, member of the Green Sports Alliance, is another great example of a green ballpark. Of course, we can’t forget about two-time LEED Silver-achieving Target Field, home of the Minnesota Twins. Recognized by numerous awards for its beautiful design, its sustainability practices and the quality of its fan experience, Target Field is an interesting and engaging site in which to study LEED certification and sustainability efforts. After being named the “Greenest Ballpark in America” and earning LEED Silver certification for both New Construction (2010) and Existing Buildings: Operations and Maintenance (2011), the home of the Minnesota Twins became the first professional sports franchise to also attain recertification as LEED Gold under Existing Buildings: O+M (2017) using Arc, the state-of-the-art digital platform that uses real-time data to help benchmark, measure and improve sustainability performance. According to the Natural Resources Defense Council (NRDC), only 16 percent of Americans follow science, but 70 percent follow sports. The Minnesota Twins hope that exposure to green processes and environmental messaging at Target Field may change environmental attitudes and behaviors. If people are exposed to composting and recycling at Twins games, maybe they will be more likely to adopt it in their own lives, along with other green operations. Environmental education and exposure is not just limited to game days. Through their environment and sustainability tours, the Twins use Target Field as a way to teach hundreds of students throughout Minnesota about sustainability. Through USGBC Minnesota's partnership with the Twins, individuals interested in or working in the green building industry are able to view firsthand the sustainability features of the stadium and how they fit in with LEED credits. We are proud of our partnership with the Twins and glad that Minnesota has a baseball team committed to sustainability and environmental stewardship. 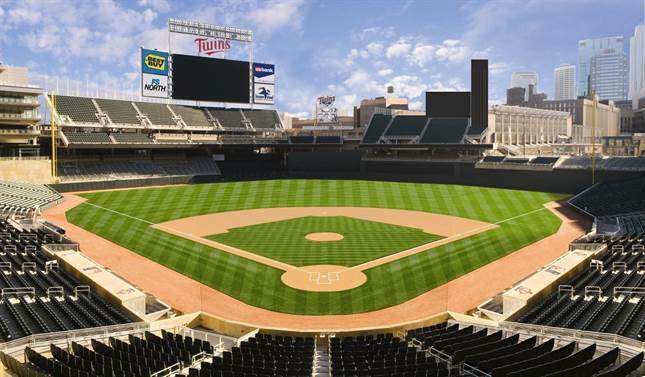 If you are looking for a fun team-building activity where your group can also earn CE hours, schedule a Twins stadium tour for your own company or group.